Dr Naicker graduated from Wits University in 2011 and went to do his community service in the rural area of Sabie Mpumalanga. He is passionate about dentistry and providing a family friendly dental experience to his patients. Dr Naicker has a special interest in minor dental surgery as well as dental implantology. He strives on providing an excellent service to his patients and prides himself on keeping updated with modern dental techniques. Dr Naicker also provides a dental sedation service for pediatric case. When out of the dental surgery, he is very active and enjoys travelling, mountain biking, gyming and spending time with family and friends. Come and visit and let him change your perception of the dentist. 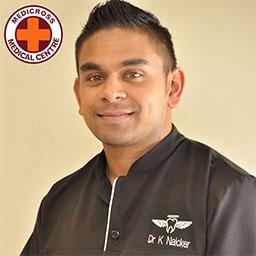 Dr Naicker is extremely professional and very good at his trade. He kept me informed and calm throughout the entire procedure. I will definitely recommend him to others. Very professional and up to date on the latest technology. Very pleasant and puts one at ease. Professional and takes time to explain and puts patient at ease. I recommend him without hesitation.